This Spring quarter, we are thrilled to offer a new and unique workshop to elementary and middle schools. 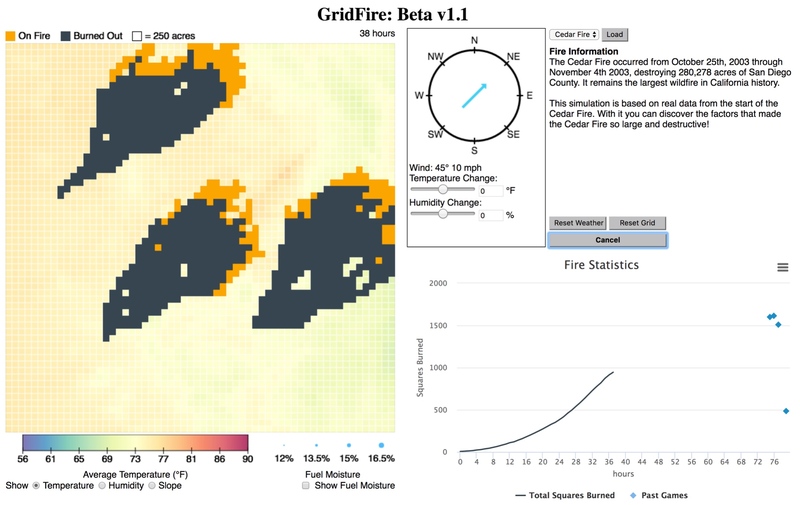 GRIDFIRE is a newly developed fun, interactive, and educational tool that allows students to play with real physics and satellite data to understand the spread of Californian wildfires. Students get to change temperature, humidity and wind direction of a true Californian Wildfire and try to stop it from spreading, while understanding the underlying components that make wildfires worse or easier to fight. Test a sample of the simulation here. Selected schools will be contacted the first week of April. The computer simulation is a MUREP NASA MIRO FIELDS Program project developed by Jeanette Cobian, Trevor Arp and Mario De Leo-Winkler, through funding provided by Prof. Bahram Mobasher.